Staying private online is easier said than done, but a few services are popping up that promise to shield your conversations from prying eyes. The Signal messaging app, previously known as TextSecure, comes to mind. 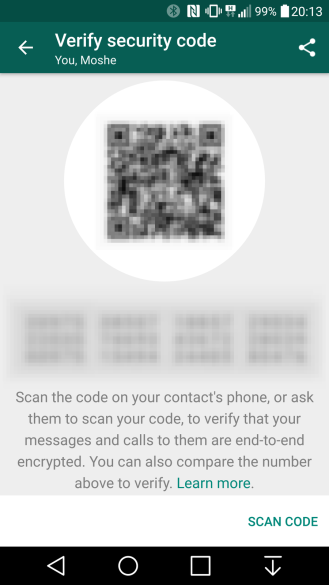 But the WhatsApp team has been working on securing its messages using some of the same code, and now, after testing things out last month, the service is ready to roll out end-to-end encryption to all users. With end-to-end encryption, WhatsApp asserts that only you and the people involved in your conversations can read your messages. 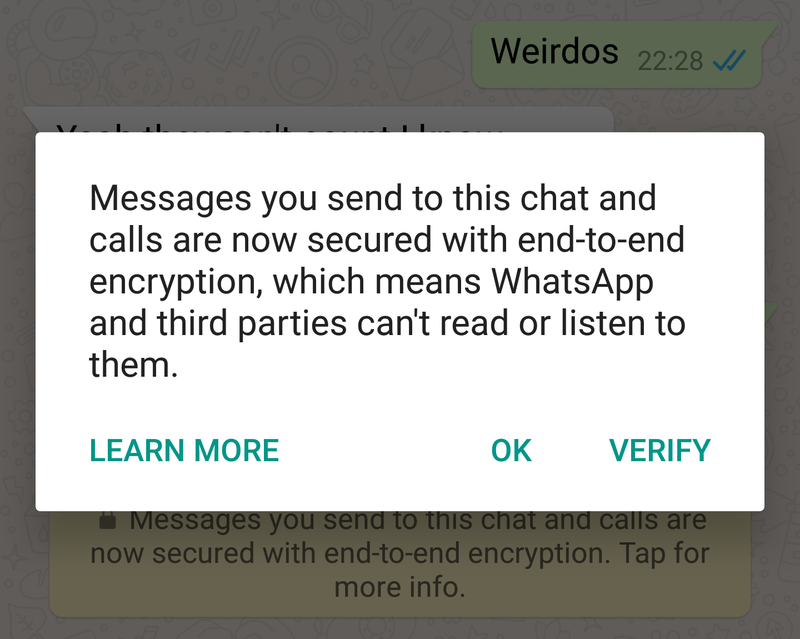 No one, not even WhatsApp, can access them en route. Each message you send is secured with its own lock, with only you and your recipients having the key necessary to unlock. 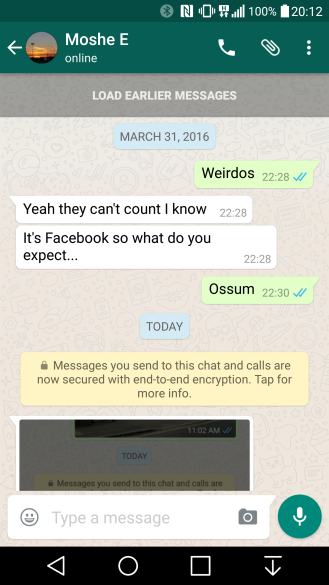 WhatsApp then claims to delete messages from its servers after they've been delivered. 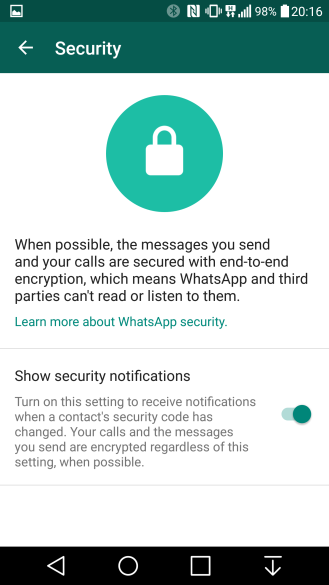 I can't speak to the extent to which WhatsApp's claims are true, but the Electronic Frontier Foundation has recently praised WhatsApp, and by extension Facebook, for frustrating the US Department of Justice's ability to access messages in real-time. This comes nearly a year after the organization sharply criticized how WhatsApp handled user data compared to basically everyone else. It's worth stating that even then, WhatsApp still scored a few points for publically opposing backdoors. 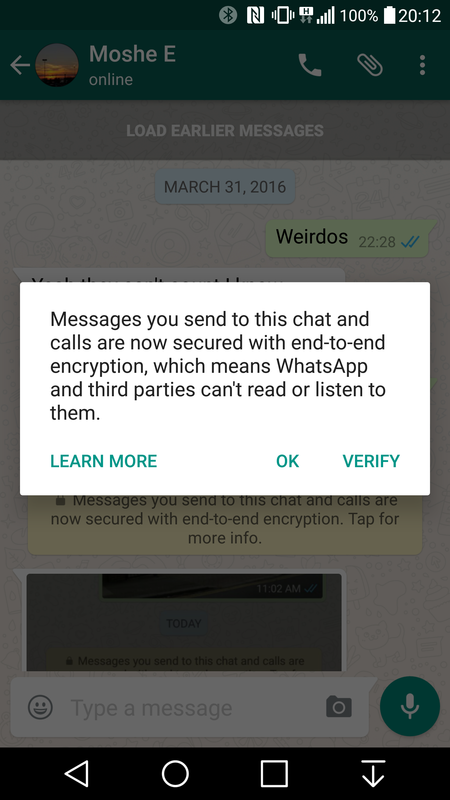 Signs of end-to-end encryption are appearing all over. Users see a message appear inside of their conversations. An option has also appeared under the Security section of Settings. This feature comes as the result of a server-side change, so no new update is required. You don't even need a friend online to try things out. Messages sent to yourself are apparently also secured. So go ahead, talk to yourself. We won't judge.